It is the dream of gardeners everywhere: A garden that will be beautiful in every season—and indeed in every month—of the year. While this may seem to be a somewhat unreachable aspiration, I can assure you it is not at all out of the question. We winter-weary Vermonters are already anticipating the flowers that will grace our gardens throughout the coming season. And many of us are also eagerly making plans for the new plants we hope to add in 2018. For me, the glorious cycle of the seasons, both in our gardens and in the wider landscape, is one of the really special aspects about life in the North Country. Soon winter will draw to a close, and by mid-April those cherished harbingers of spring—snowdrops, daffodils, bluebells and crocuses —start to push up through the cold earth to welcome the new growing season. And out in the forest, ephemeral wildflowers carpet the ground and the serviceberry trees burst into boom. By mid-May, as the ephemeral wildflowers start to retreat underground, the woods are clothed in pale green leaves. And in our gardens, even as late-season daffodils are still flowering, the crab apple trees cover themselves in delicate pink and white blossoms. Then the lilacs, peonies and roses, with sumptuous blossoms and intoxicating fragrance, all burst on the scene, and early perennials like catmint, salvia and veronica start to flower. July and August is high summer in Vermont. 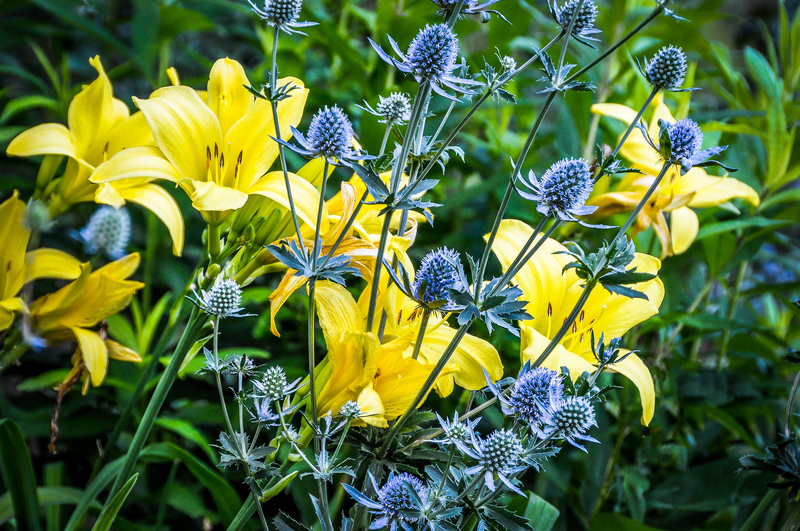 This is when many garden favorites—coneflowers, false sunflowers, Shasta daisies, blazing stars, daylilies, sea holly, helenium, smooth hydrangeas and many more—put on their show. But by mid-September there is a rustle of drying leaves in the air, whispering that fall is just around the corner. Now it is time for the black-eyed Susans and panicle hydrangeas to bloom, soon to be followed by the purple fall asters. These classic flowers of autumn, together with Vermont’s brilliant fall foliage, combine to create a truly memorable ‘grande finale’ to the growing season. Before long the first snowstorm transforms everything. 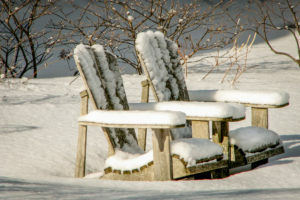 And, as winter settles in, it is time to enjoy the world outside from the warmth of our homes. The winter scene is primarily monochromatic, with a simple beauty all its own. Fresh snow highlights the shapes of trees and shrubs, while two wooden chairs become the ghosts of summer. But even in winter we can observe patches of color as the stems of blueberry and dogwood bushes glow red in the low-angled sun and some tall parchment-colored grasses sway in the wind. Of course, whatever the season, not all days are bright and sunny; there will also be gray days and rainy days. But for me the dreary times only serve to highlight those days when the sun is shining and the sky is blue— when I have a smile on my face and a song in my heart. One of the best parts of planning a garden of any size is selecting a medley of plants that will give flowers from spring until fall. But, as we know, most flowering trees, shrubs and perennials only bloom for a few weeks each season, making it tricky to know which plants will actually be in flower together. Photographs of your garden, as well as of those you have visited, can be invaluable reminders of when different plants bloom. Look through all your pictures to find ones showing flowers that you especially like. Copy these to a new album on your computer and organize them according to the day and month when each photograph was taken. 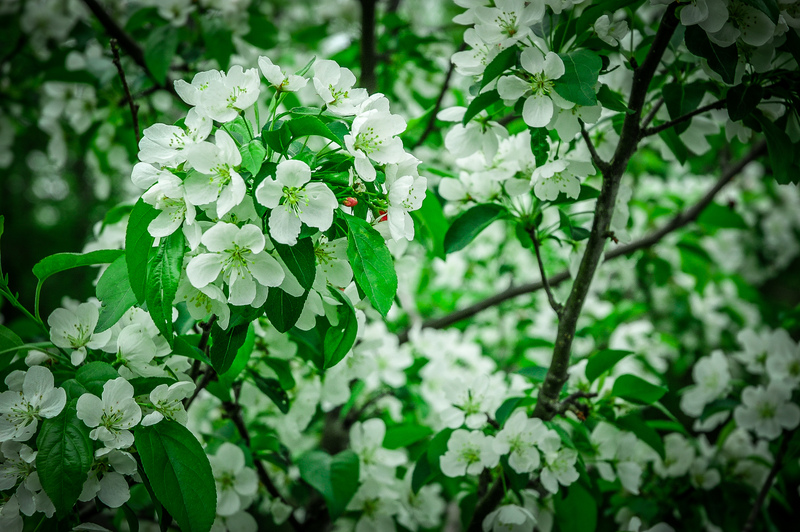 This will quickly give you a sense of the flow of flowers as the season progresses. You can also take this idea one step further and make your own ‘seasonal bloom chart’ that displays the names of all the plants you like and when they bloom. Take a large piece of paper and mark the weeks from May till October along the top and bottom of the page. Now, starting in early spring and continuing throughout the season, list the plants of interest down the left side. Then, for each plant, draw a colored block showing the weeks it is in bloom and its approximate color. 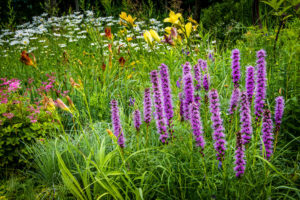 Jane Sorenson and her husband David Marchant of Fairfax, VT grow an abundance of hardy pollinator-friendly plants which they sell both at their farm and through their website. And, to help gardeners choose pollinator-friendly plants that will also flower together, Jane has developed several great bloom sequence charts for various plant types— perennials, annuals, shrubs, trees, vines etc (all hardy in Vermont)– which you can download from http://www.riverberryfarm.com/pollinator-plants-at-river-berry-farm/. 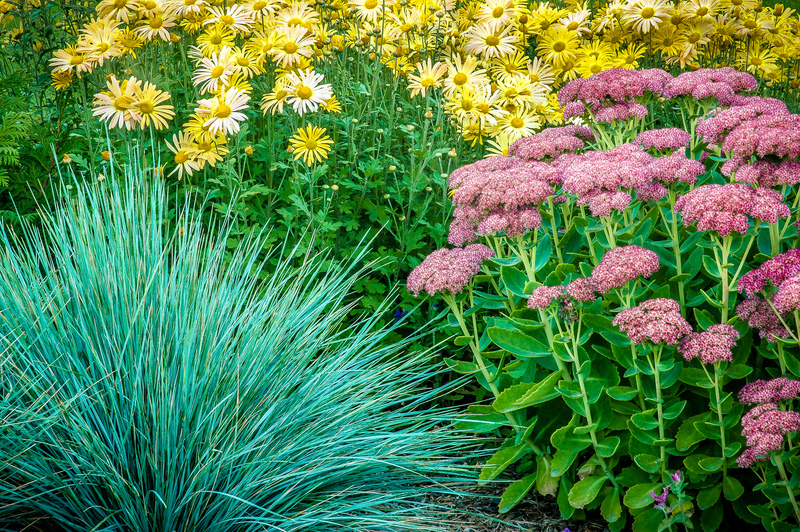 Once you know how to choose plants that will bloom at the same time, now plan how best to combine them so that their individual colors, shapes and textures blend harmoniously together. When mixing flowers of various colors most gardeners just follow their intuitions and get great results. Think of yourself as an artist who paints pictures with plants and you cannot go wrong. 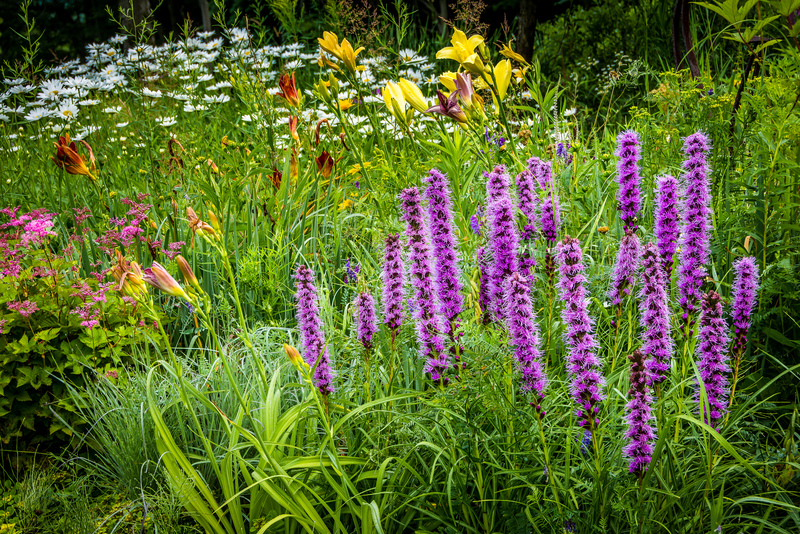 High summer in my densely planted pond bed: with their contrasting colors and shapes of purple Blazing Star (Liatris spicata) with white Shasta Daisies (Leucanthemum superbum ‘Becky’), and some yellow daylilies together make a great picture. 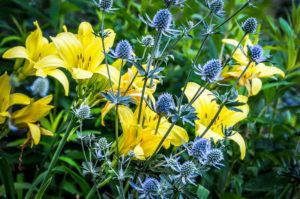 For instance I combined the purple candles of Blazing Star (Liatris spicata), some Shasta Daisies (Leucanthemum superbum) with white daisy-like flowers and yellow centers, along with some yellow daylilies. Here the complementary shapes delightfully enhance their contrasting colors. If you want to delve further, there are plenty of good books on the subject. My personal favorite is ‘The Gardener’s Palette’ by Sydney Eddison, a talented artist who lives and gardens in Connecticut. She provides an easy introduction to the ‘artist’s color wheel’—a device that has been long used by artists to describe the varied emotional responses people have to different colors and color combinations. And she illustrates each of her points with plenty of great photographs from her own garden. You can also purchase her stand-alone ‘Color-wheel for Gardeners’ and use it to explore your own reactions to different color combinations. As we have seen, our favorite flowers tend to come and go as the season unfolds. So, to create a calm and lasting backdrop, be sure to include plants with beautiful leaves in your garden plans. For shady corners swaths of barrenwort (Epimedium rubrum) and big-rooted geraniums (Geranium maculatum) together with a mix of ferns will create a constant presence from May onwards. For damp spaces both the Umbrella Plant (Darmera peltata) and Rodger’s Flower (Rodgersia aesculifolia) will make grand statements. And, for sunny spaces, prairie grasses like Blue Oat Grass (Helictotrichon sempervirens), Switch Grass (Panicum sp) and Little Bluestem (Schizachyrium scoparium) all combine beautifully with our favorite summer flowers. Wise gardeners will also include plenty of woody plants, both deciduous and evergreen, as well as some beautiful garden structures, in their garden plans. 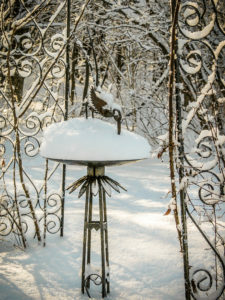 They will also position these year-round elements so that, in addition to gracing their gardens from May till October, they will also stand out in the snow during those other six months when we mostly view our gardens from our kitchen windows. 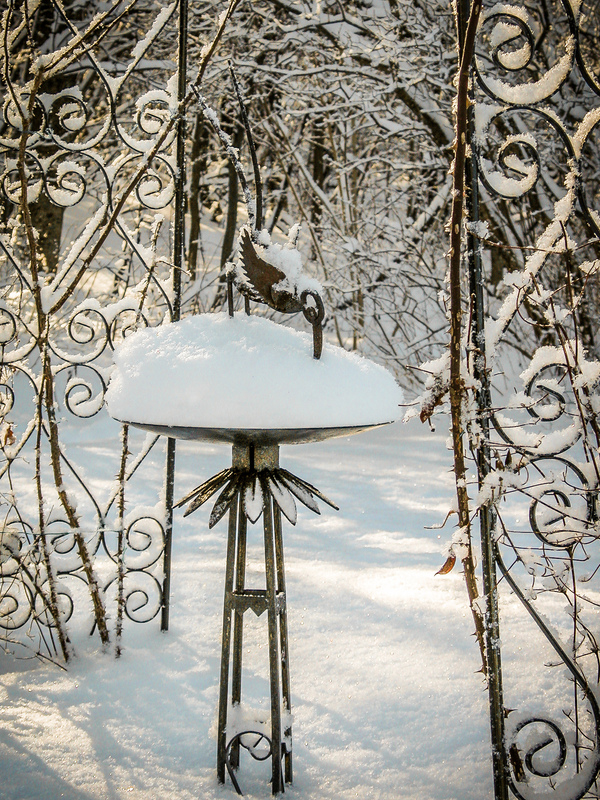 For more on creating a garden that will be as beautiful in winter as in summer check here.